Wacko Christians Burning Books? What else is new? Christians have been burning books since before Gutenberg sorted out moveable type. The Library of Alexandria was ordered to be destroyed by a Christian bishop in 391. The same assholes murdered Hypatia, one of the most intellectual philosophers and mathematicians of her time. Why? Because she was woman who didn’t believe as they. Before that, the Library of Antioch was burned by Christian emperor Jovian. Why? Because Jovian’s predecessor established the library and filled it with texts that didn’t jive with Jovian’s superstitions. Lest we go on thinking Christians only burn the books of those who aren’t Christian, we must consider that poor sod Priscillian of Avila who was brutally executed as a heretic, his writings nearly all destroyed -burned by his fellow Christians. It seems he didn’t believe as they did. 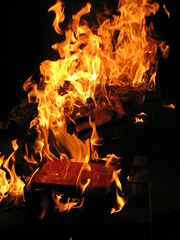 The church council of Soissons, France, in 1121, forced Peter Abelard to burn his own book! Another Christian heretic oppressed by other Christians with apparently more right to think as they did than Abelard had to think as he did. At least they didn’t murder him. They just locked him in a convent for good. The first ever Inquisitor General of Spain (c. 1480) promoted the burning of non-catholic texts (written by people who don’t think as Christians do). But surely Christians were satisfied with the books of Europe, right? Wrong. Diego de Landa, the Christian bishop who spread his superstitions to the New World (along with syphilis, TB, small pox, etc.) burned the few books ever written in the Americas by non-Europeans at the time. Lost forever to academia are the sacred texts of the Maya along with many of their images and cult items. The worship of a non-white, bearded god like Quetzacoatl is clearly not thinking like a Christian. And it goes on and on. Through all of Christian history. To as recent as 2009 in North Carolina, USA where pastor Marc Grizzard of the Amazing Grace Baptist Church had a book burning on Halloween. Grizzard burned books by the likes of T.D. Jakes and Billy Graham -Christians! Why? You guessed it: they didn’t think like Grizzard and his particular notion of Christianity. Hey, Christians aren’t the only book burners in history. Not by a long shot. But the do it so well. And, when Jim West at Zwinglius Redivivus says the nuts at Dove Outreach Center in Florida aren’t “true Christians,” I’d have to disagree. They’re completely consistent with Christianity so far. These particular Christians are hatemongers (something else not inconsistent with Christianity through history) who are very likely going to provoke extremist Muslims (also no strangers to hatemongering). But burning korans (or even bibles) is their right to free speech. Personally, I find it despicable and depraved. Despicable because books ought not be burned but read; depraved because these Christians deify and anthropomorphize the book itself with a power it truly doesn’t have. But, such is to be expected from the superstitious. This entry was posted in Culture Wars and tagged Book burning, Christianity, Diego de Landa, Freedom of speech, Library of Alexandria, Religion and Spirituality. Bookmark the permalink.